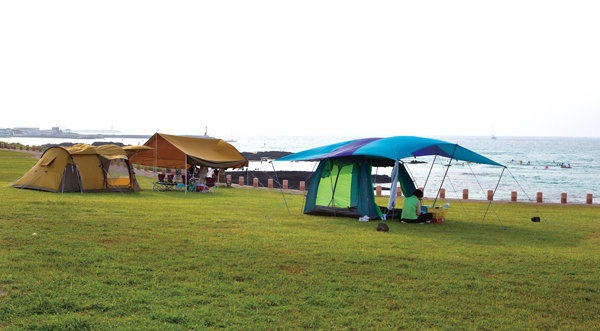 Click here for a full map and guide to Jeju campsites. To download the full Jeju Travel pullout in pdf click here. - Ed. Before I came out to Jeju Island, I couldn’t stop thinking about how awesome the camping must be here. With all the amazing beaches plus tons of nature and woodlands, I thought I would be camping all the time! I pictured myself lounging around a beach campfire with new-found friends, enjoying our carefree lives on the island. Or we would return to our tents after a day mountain hiking to cook hot dogs on twiggy roasting sticks, before watching the sun go down, the fireflies come out, and the stars light up the sky. Although camping on Jeju hasn’t quite lived up to my Midwest-American ideals, my first Jeju camping experience at Iho Beach was all that I had imagined. I arrived in late September, outside of “beach season,” when, unbeknownst to me, the fun police weren’t on high patrol. There was a big bonfire, food, drinks, and fireworks. The weather was perfect. The sand (and a few drinks) made for a great night’s sleep, and I woke up in the morning to stumble my way to the ocean for a morning swim. It was a while until my next camping excursion as winter came and went and I looked forward to spring. One May weekend, a group of us went to Udo Island with tents, sleeping bags and coolers in hand, ready to spend the weekend relaxing on white sands. ...and then came “beach season.” The next attempt at a camp-tastic weekend took us to Hamdeok Beach, in July, the peak of beach season. We arrived later in the afternoon and targeted a side beach, away from the masses, but still on the sand and near the water. As we began setting up a tent in a secluded corner of the beach, a Korean man approached and gestured for us to move away from the beach. All I could understand was “anieyo” (no) and, since I struggled to understand him, I continued putting up my tent. After storming off, he returned a few moments later with a broken beach umbrella, this time asking for 10,000 won. Thinking he was asking for money to pay for his umbrella, I again continued staking my tent. He stormed off once more, only to return this time with a police officer. I began to worry we were going to be wrongfully arrested for damaging the man’s beach umbrella. “They’ve got the wrong westerners,” I thought. Luckily, the police officer, donned with a sash reading “beach patrol,” spoke enough English to explain that camping on the beach was not allowed. Instead, we could rent a flimsy, broken, umbrella from the disgruntled gentleman, or set our tents up across the street in a camping zone surrounded by hordes neon super tents bigger than my one-room apartment back in town. What?! I was so confused. I had been beach camping twice already on Jeju. Why was this different? “It’s beach season,” the police officer explained, “Camping on beach, no.” Disheartened but still set on camping, we disassembled the tents, and walked over to the camping area to look for a spot. The area was packed with tents, hammocks, chairs, gas ranges, and people. It looked like some campers had actually just brought their kitchen with them as they had full-sized floor tables, sitting mats, pots, pans, and enough cutlery and food to make gourmet meals. My single tent, sleeping bag, and gimbap triangles just did not stack up. Finding a small place to squeeze in up against the trees, we set up camp. It wasn’t the beach camping I wanted but I would make it work – I was basically woods camping now, but still near the beach. Despite being packed in like the tinned sardines in my lunchbox, our tent neighbors were friendly, offering us food and even joining in on our sing-alongs. The morning walk to the water may have been a bit longer than desired, but the ocean still felt amazing. And, it was still camping, and camping on a beautiful island. Since my early “unorthodox” camping experiences, I have had a variety of experiences ranging from “just what I imagined” to “I have no idea how people can camp like this,” and along the way I’ve learned a few things. ▶Campfires are a “no-no.” In the packed camping zones, there is often no room for fires without setting ablaze all the surrounding tents. ▶If you want to have a less rule-enforced camping experience, either stay away from the typical camping locales or, in regards to beach camping, limit your camping trips to outside of beach season. Camping on Jeju may come with a bit of culture shock, but it is well worth the experience. 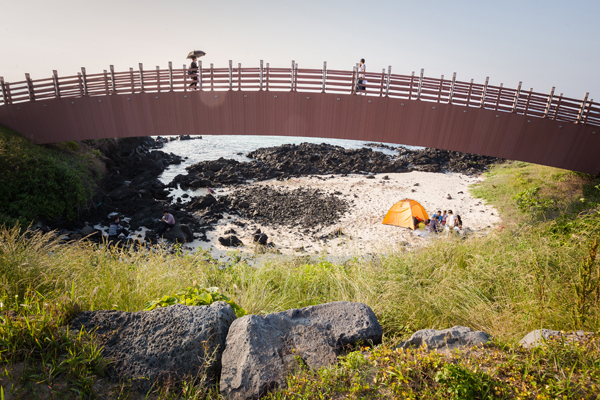 There are a lot of great camping spots throughout the island, all offering a unique way to experience the nature, and culture, of Jeju.